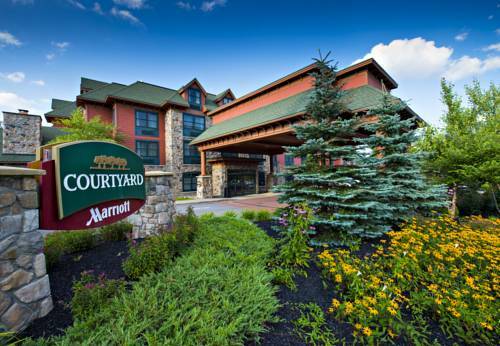 The Courtyard Lake Placid offers a comfortable, convenient home away from home for your visit to the breathtaking Adirondack Mountains. Featuring a picturesque location in the historic village of Lake Placid, our recently renovated hotel welcomes guests with spacious, intelligently designed hotel rooms and a wide assortment of helpful resources. Each hotel room boasts plush bedding, a flat-screen TV, a mini-fridge, and an ergonomic work area, while our hotel suites provide fireplaces and whirlpool tubs. Our hotel's additional amenities include a fully equipped fitness center and indoor pool, an outdoor fire pit, and flexible, stylish event space. We offer unparalleled access to the Lake Placid area's most noteworthy destinations; our hotel is only minutes from top-quality skiing and snowboarding at Whiteface Mountain, and we're also near the Lake Placid Olympic Center and a remarkable selection of exciting outdoor activities. Treat yourself to a memorable adventure at the Courtyard Lake Placid. ~31 miles from Lake Placid.